We are so happy to share our love for little Miss Paityn’s family by offering to Pay it Forward while also giving the opportunity for one special couple to bid on their dream wedding photography package. 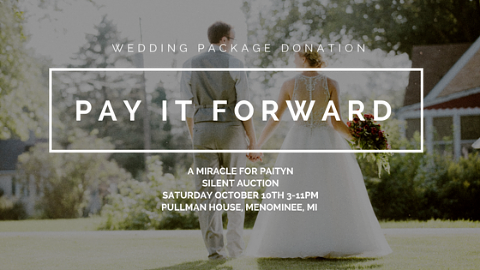 On October 10th, 2015 there will be a benefit, silent auction, and raffle at the Pullman House in Menominee, MI, benefiting Paityn Walters and her family. Magdalene Photography is donating a wedding package valued over $3,000 for the silent auction. Be sure to share with friends and family. There will be many large items up for auction and raffle. Read more about Paityn’s story and see pictures of her journey below. 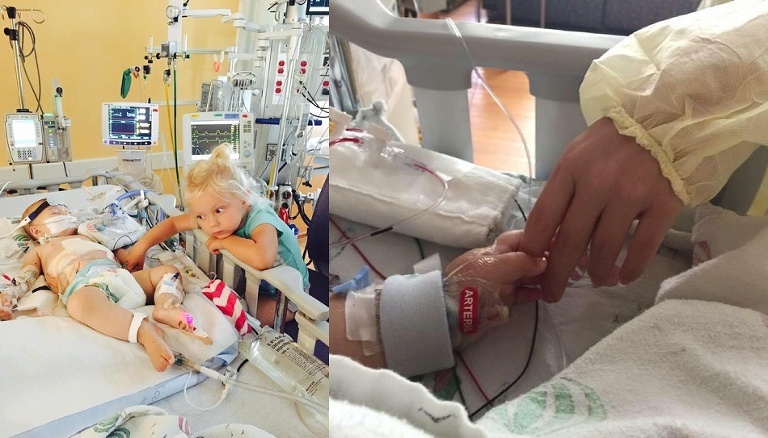 At less than a year old, Paityn was diagnosed with acute liver failure. Thankfully, she received a liver transplant from her cousin, Caitlin, at Children’s Hospital in Milwaukee, WI, on July 27, 2015. The miracle of a liver donated by her cousin Caitlyn saved her life, although this does not come without complication. Paityn, along with her mom and dad, has been at Children’s Hospital for over three months, and they are unsure how many more months are ahead. It has been an emotional rollarcoaster caring for their daughter, praying that she can live a happy, carefree life, as well as dealing with the loss of work, hospital bills and travel expenses. Erin’s story was the hardest to tell. I am not going to lie I was so very nervous to photograph her. Although after knowing her for a few minutes I realized she is stronger than I could have ever imagined. She was the one comforting me. Making me smile through the tears I was telling myself the whole day I would not shed. I am honored and blessed to share our sixteenth xoBeautiful project reveal. Erin was photographed at a gorgeous Door County WI Wedding venue. 7501 Mariner Road – One of the most Luxurious Door County Waterfront Homes. A dream location for wedding photographers in Door County Wisconsin. This photo shoot means the world to me. My fiance and I were together 9 years and actually got engaged today (Jan 28th) two years go on top of a mountain top in Idaho doing our favorite thing together, snowboarding. It was beautiful!! We were to get married on June 21, 2014 but sadly he passed away in a avalanche last February. I had just gotten my dress the week before and we were to pick out rings when he got back from his trip out west. I love my dress but I never got to wear it. I am so excited that I get to wear it and show everyone how beautiful that day could have been. I’m excited to introduce Molly, our seventeenth xoBeautiful project reveal. Molly was photographed at a gorgeous Door County Wisconsin Wedding venue. 7501 Mariner Road. Egg Harbor, Door County, Wisconsin – One of the most Luxurious Door County Waterfront Homes. A dream location for a destination wedding in Wisconsin. Molly’s Story in her words why she wanted to be involved in the xoBeautiful project: // Side note (from Jen) Molly is everything you could ever hope a true friend to be. I am blessed to have had her along on this journey. There are many times I looked at her and thought “Thank god for Molly”. We laughed so hard we cried. We cried reading each woman’s stories. From what was “Hey Molly! Do you want to be a part of the xoBeautiful shoot” to Molly being there at every single moment of this crazy beautiful project. I am now honored to call her my friend. She has no choice, I’m a lifer now. Haha!!! It is hard to describe the “why” behind why I wanted to participate in Magdalene Photography’s xoBeautiful project. It might have been the desire to be surrounded by strong, wonderful and inspiring women and remind myself how empowering it can be to feel beautiful once in a while. It could have been the opportunity to make these women feel amazing for a day. Or, it could have been the fact that I wanted to make sure my friend, Jen, could see her vision finally come to life. I find that most of my girlfriends, matriarchs in my family and even female acquaintances often struggle with loving their bodies and their overall general appearance. I know, it might seem petty and vain to some- but I think happiness and acceptance of others, even, starts with your own self-love. At an age, where most kids are excited to have their shiny new driver’s license and the anticipation for a summer filled with independence might just kill them- I went through a summer of countless doctor visits and heart monitors. I won’t say that my medical issues were horrific, but they shook me and changed me from that moment on. I went my entire summer with a heart monitor placed on my chest and the echo of my doctor’s warning that a pace maker might be the end result ringing in my ears. Being 16 and facing the thought of my chest being opened and a small box being placed inside, is not what I thought I would be doing that summer. Luckily, it did not have to result in that. A simple change of lifestyle and medication would hopefully keep the beast at bay. However, most things in life are not that simple. My medication wreaked havoc on my body and my mind. I would gain 10 lbs. one week only to lose 20 the next. It caused me debilitating migraines, acne, mood swings and countless other side effects. My body was becoming scarred and weak and my self-esteem tanked. I don’t often speak about this time in my life because of the internal struggle I went through. To keep my parents and friends sanity, I would always tell them I was fine and that this was nothing we had to worry about. All while on the inside knowing that I was one more mishap away from a breakdown. I finally found the strength to simply give in and let myself accept the facts. My life, would not be the same. My hobbies, my activities, my life- would have this problem shadow it at times. I’ve grown since then and I’ve learned to live with what I have. I don’t let it defy me, in fact, I rarely bring it up to people. I do have scars- I won’t be the “skinny” size I used to be and I even love my curves now. Do I still have moments of self-doubt? Of course. I wouldn’t be honest if I tried to lie on that one. Luckily, I do have friends, family and a very loving man to remind me of just how beautiful I am on the inside-out. All of the women that were showcased in this project are amazing women who embody strength, beauty and perseverance. My story does not remotely compare to others, but the importance of this project is to realize we all struggle at times and yet we all seem to persevere. Life has a funny way of slowly knocking us down and it takes moments like a xoBeautiful project, to remind us all just how beautiful and wonderful we individually are. Even though she has not had her wedding yet. She will someday be the most beautiful bride and I will be there to capture it all. I was never a bride. I have never had a wedding day. But to twirl around in beautiful gowns with a wonderful soul like Jen from Magdalene Photography there to capture it all, was beyond words. Then, to help be her assistant and pamper and watch all of these women come to life in front of the camera, is truly something that I will hold very dear to my heart. I hope this project not only inspires but reminds us all how beautiful each of us are in our own unique way. As you may remember from my first post, I mentioned that I had loved ones fill out a fun survey about each lady. Molly’s friend, Nikki filled this one out for her. Describe her in 4 words or less: Fabulous in every way! Why do you feel she needs this day to feel beautiful and be a model for the day? Molly will always put others before herself, whether it is through her work or personal life. She doesn’t set aside the time to pamper and spoil herself even though she deserves it. Many may say that I am biased since I am her best friend but I believe that makes me the perfect candidate because I know what is best for her! What makes her special? Her ability to make magic in the kitchen! Describe a funny memory or moment about her. It is hard to choose from our long laundry list but my favorite would have to be our dance party. The shades were open, many classic songs were played, and interpretive dancing commenced. As Celine Dion, Katy Perry, and Whitney Houston played we did not laugh simply because we were making fools of ourselves but because I knew no one else understood me like Molly. If she could spend a day with any actor/actress for the day who would it be and why? Daniel Craig because he is an attractive middle aged man. I will be revealing the story of each of these incredible women over the coming weeks. I invite you to come along on the journey, and find your own xoBeautiful with me. I absolutely fell in love with this style of session, and will definitely be adding this to my session line up soon. © 2019 Magdalene Photography|ProPhoto Photography Theme|Design by Northfolk & Co.